My first thought when I woke up today was, "Dammit, I wish I didn't throw away the rest of those oatmeal cookies from last night." I had sworn off cookies before I went to bed, thinking I'd never in a million years eat another one, and then I woke up with them on my mind. Kind of like alcohol... you know how when you drink too much and get sick, you tell yourself that you're never drinking again? And then the following weekend, you're over it. And the pain of eating too much sugar and feeling sick is similar to childbirth in the sense that you completely forget how bad it was until you do it again, and you think, "WHY didn't I learn my lesson the first time?!" But the cookies were in the trash with coffee grinds on top of them, so they weren't salvageable. That's a good thing, because I totally would have pulled them out. Well, I'm going to try to keep in mind how sick I felt last night, and hopefully I won't repeat the crappy eating again next week when I have a day "off" of counting calories. Today was back to counting, and I did fine with it. I had a pretty lazy day, actually. I read some blogs while I drank my morning coffee, then I sat outside and painted my toenails--they were looking really shabby! I don't do nearly as good a job on the French pedi as they do in the salon, but I can't afford am not willing to pay someone to do what I can do for free. Besides, I HATE pedicures. Seriously, I can't stand the scrubby thing they use on the bottoms of my feet, and I'm super ticklish, and I usually end up kicking the poor girl in the face when all she is trying to do is make my feet look pretty. I finished reading the book that I bought yesterday at a garage sale--I'm seriously the slowest reader on Earth, but I managed to finish this book in about 24 hours. It is called "The Butterfly Garden", a memoir by Chip St. Clair. I love memoirs, and this author was from Michigan, so I bought it on that alone. This book was amazing horrifying. He was abused by his father for his entire childhood, and when he was an adult, he learned that his father had escaped from prison before he was born. His crime? Murdering a 3-year old boy (and possibly other kids, too). I typically like memoirs because I know that everything turned out okay (the author is well enough to write the book, so I know that they didn't DIE or something). However... when the author described the murder of the 3-year old boy, I almost vomited. Not from the horrendous amount of cookies I had eaten, but because of the sickening image this put into my mind. I wish more than anything I hadn't read it, because I'll never get the image from my mind now. I don't want to type all the details, but the boy was beaten to death while his 6-year old brother watched, and then the brother was stomped and beaten (almost) to death. He lived, thankfully, but his poor little brother did not. Knowing that this was a true story broke my heart. Speaking of sick assholes, I discovered something disturbing on my blog recently. 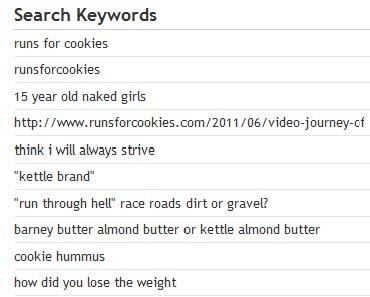 One of my favorite things to look at is my "stats" page, where it shows the phrases and keywords that people Google in order to arrive at my page. For example, someone may google "Ragnar Relay Minnesota" or "stray Himalayan cat" and wind up at my page because of posts that I've written that include those words. It just doesn't fit in! Perv. It doesn't tell me anything about WHO typed that--it just tells me the phrase that was typed. Anyway, I noticed that one of the phrases was "15 year old naked girls". I'm guessing that they arrived at my blog because I have an entry titled "Naked Pictures" and while I would never post naked pics of ANYONE on my blog, I talked about how, at a garage sale, someone was selling a cell phone with naked pics on it. This completely disturbed me that someone was typing that into Google. I know that there are thousands of perverts out there, but now I know at least one of them saw my blog. Gross. My husband is off work tomorrow for the first time in (I think) 10 days. He works 12-hour shifts, so I have felt like a single parent lately. I'm SO HAPPY that he is off tomorrow! Hopefully the weather is as nice as it was today, and maybe we can go to the State Park or something. Well, I hope you all had a super fantastic weekend! Yikes! Blogger stats never fail to be interesting for me - but never this crazy!! !